We are entering month 4 of the Harry Potter 2011 Book Challenge , and it’s time for a fourth giveaway. 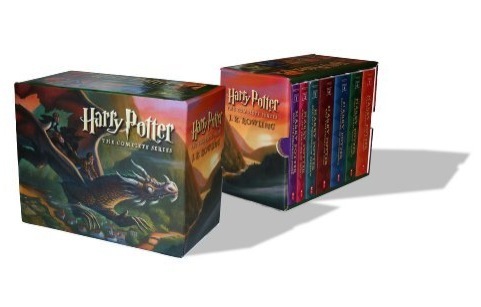 To help you complete the challenge, we are once again giving away one Harry Potter Paperback Box Set (Books 1-7) . 1) Sign up to take part in the challenge, you can do so here . Note: Make sure you use the same email address in the form, as the one you used to sign up for the challenge. The giveaway is open until April 9th 2011. Good Luck! The entries must be received by April 9th, 2011 before 11:59pm Pacific time. The giveaway is only open to residents of the United States and Canada 18 or older. No PO box shipping address. Daemon’s Books assumes no responsibility for lost or late entries, as well as any technical malfunction. Prizes lost, stolen, or damaged during shipping cannot be replaced. Winners are responsible for any taxes resulting in their receiving the prize. No cash or other substitution may be made, except by the sponsor, who reserves the right to substitute a prize with another prize, if the prize is not available for any reason as determined by the sponsor in its sole discretion.